U.S. Schools Can Help Win the "Entrepreneurship Championship"
Extraordinary feats in the sporting world inspire young people to dream. The Golden State Warriors just made basketball history by becoming the first team in the NBA to rack up 73 wins in the regular season and are vying for a second straight championship. Aspiring NBA stars in school gymnasiums across the U.S. are now dreaming of becoming the next Stephen Curry. While dreaming of sports greatness has a powerful and storied place in the American psyche, it's time to inspire other dreaming in the nation's youth -- dreaming that ignites and sustains long-term economic energy in every community across the country. Communities and schools across the country must scout out the next generation of business builders, sharing business success stories and coaching them to navigate opportunities to create their ideal jobs. This effort is essential, because small businesses provide 55% of all jobs, and they have accounted for nearly two-thirds of all net new jobs in the U.S. since the 1970s. But small business startups are in serious decline, so America needs a strategy to reverse the trend. The nation's stability -- and the well-being of its citizens -- is dependent on winning the "entrepreneurship championship." The game plan should start in U.S. schools. Entrepreneurs need to develop a level of comfort with challenges and failure. Schools are safe landing spaces for startups, where many caring adults can coach and steer them. Furthermore, schools can provide training for future business builders who need to practice taking risks, focusing on goals and building effective teams. Because of the critical role talented entrepreneurs play in communities and the U.S. economy overall, Gallup added items to the Gallup Student Poll to help schools begin to think about developing business builders earlier in their lives. 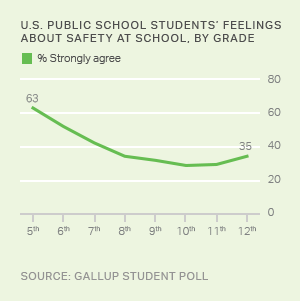 The poll's results are based on a convenience sample of more than 900,000 U.S. public school students in grades five through 12 from 3,300 schools, representing more than 550 school districts across 46 states. The survey includes a range of items that provide feedback on the readiness of the nation's students for future success. I will invent something that changes the world. I plan to start my own business. I am learning how to start and run a business. I have my own business. Just 16% of students from the 2015 Gallup Student Poll strongly agree that they will invent something that changes the world; more students (24%) strongly disagree with this statement. One in four students surveyed in fifth through 12th grade strongly agree that they plan to start their own business -- not hope, think or wish, but plan to do so. However, aspiration seems to outpace access to the knowledge and skills students need to be successful; just over one in 10 students (13%) strongly agree they are learning how to start and run a business, and nearly three times as many (37%) strongly disagree with this statement. Few students (6%) indicate they have their own business, but it is critical to support these young risk-takers in developing business focus and accessing resources to increase their likelihood of success. Recognize students for innovating and acknowledge the ones who find and keep customers. Good ideas alone do not result in successful businesses, but finding and keeping customers does. Showcase successful ventures on campus and distinguish these winners in the same way you recognize stars on the field or the court. Identify and develop specific entrepreneurial talents. Gallup's research shows that the best business builders use some mix of 10 innate talents to start or grow a business. Gallup studied the best entrepreneurs to understand the actions and decisions that lead to venture creation and growth. Gallup's Builder Profile 10 (BP10) is an online assessment that helps people discover and develop their business-building talents. Insights from the tool can help high school students get ahead of the game -- and can help more of them win in the long term. Recruit successful business owners to become mentors for young entrepreneurs. Just one-third of students surveyed in the 2015 Gallup Student Poll strongly agree they have a mentor who encourages their development. Having a mentor is valuable for aspiring entrepreneurs who need to navigate a variety of daunting challenges to start a business that survives, thrives and employs others. Young people are the best hope for creating the good jobs of tomorrow. Let's help these future business builders get a head start. The nation needs every one of them to win. 66% of superintendents say their district is very effective at providing a quality education. Employers believe that college graduates aren't developing the skills needed for the 21st-century workplace. Millennials agree. If America is going to dominate the world again, the country has to fix the spirit of free enterprise. Small-business startups are in serious decline.